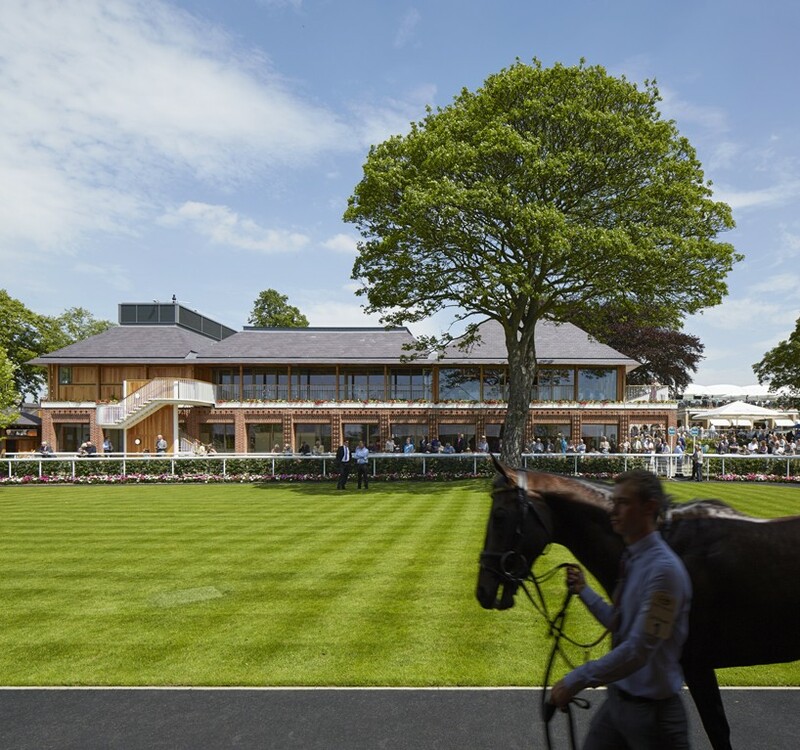 York Racecourse, one of the best and most regarded racecourses in the UK, has undergone a £10m redevelopment by Phelan Architects bringing it in line with some of the best equine facilities in the world. Home to the Welcome to Yorkshire Ebor Festival, one of Europe’s leading racing festival premier handicap races, the racecourse attracts 330,000 race goers each year and the owners, trainers and jockeys of the world’s highest rated thoroughbreds. Phelan’s masterplan, driven by a need for improved equine and racegoer experience of visiting York, is the first comprehensive redevelopment of the Northern end of the site since 1908. The scheme comprises a new weigh-in building, complete with a fine dining restaurant, new saddling boxes and a new pre-parade ring; improved vet and wash down facilities and extensive works to the Champagne lawns improving both the view and utility of the original grandstand – the oldest sporting stand still in use in the world, the grade II listed John Carr Stand which dates from 1754 . 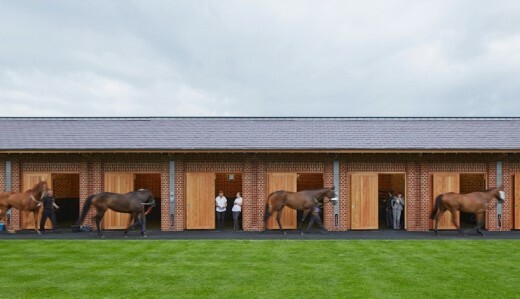 Drawing on the materials of the racecourse with a palette of brickwork, timber and slate, Phelan has separated the equine buildings into clusters to express their different functions whilst organising them in a stable yard arrangement, built around the perimeter of the new larger, flatter pre-parade ring, to provide a familiar and calming environment for the horses. The most significant building and largest single element, the two-story weigh-in building, is on the eastern boundary. Here, the ground floor has been designed with a glazed cloister along its western side to afford views to the pre-parade ring and demonstrate some of the theatre of racing as the jockeys and officials conduct their business. A timber construction differentiates the first floor whilst the roof is broken down into individual volumes to reflect the internal organization. Building forms are kept as simple shapes to minimize the scale and massing of the design and the main elevation, fronting onto the parade ring, incorporates a verandah with a decorative metalwork screen showing Yorkshire Roses and barber pole ribbon columns that provide a visible and recognisable motif of York Racecourse. Pre and post race activities are separated to keep a very clear equine circulation with unsaddling taking place out of the public eye at the rear with equine showers around a dedicated wash down yard. Vet facilities are enhanced in scale, with a stocks box and read access to both pre and post race activities. Working around the racing calendar, the 2½-year project was completed in two phases with the main equine facilities opening in May 2014. The second phase, which racegoers have enjoyed since May 2015 incorporates a new owners and trainers entrance building, a new Moët Pavilion with roof terrace, and extensive works to the Champagne Lawn included the opening up and framing of the John Carr building. The first of its kind, the building marked the start of a typology of grandstand buildings. Revealing and celebrating the historic building, Phelan’s scheme incorporates an oversailing lightweight canopy structure to provide weather protection to the terrace.